1.1 cu. 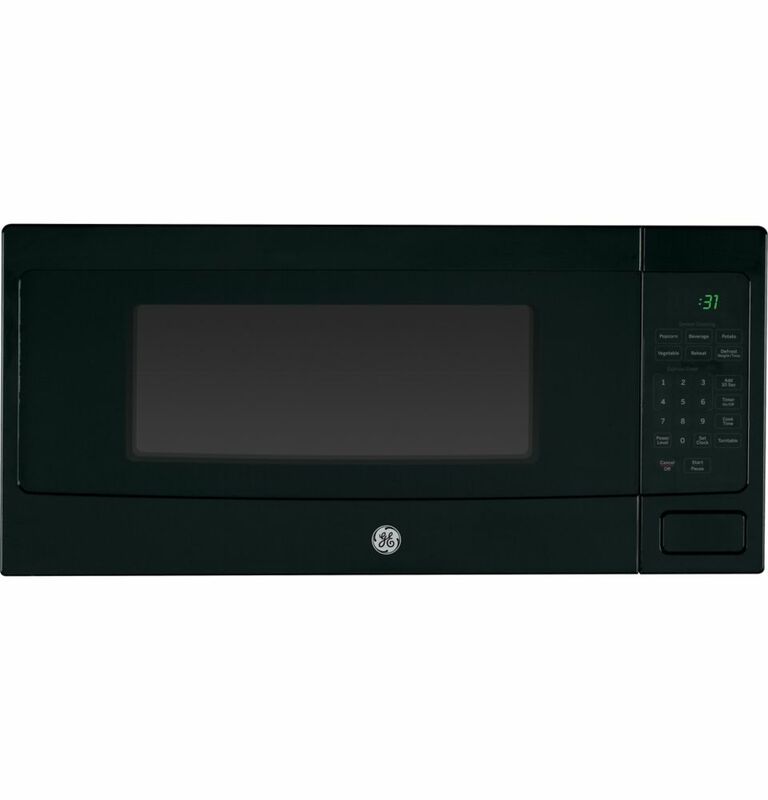 ft. SpaceMaker Microwave Oven in Black Set the GE SpaceMaker on a countertop or build it seamlessly into your kitchen cabinets with one of the many optional kits available; either way you're sure to love all of its innovative features! The Electronic Scrolling Digital Display gives you ultimate flexibility program several functions at once for meal preparation. The Instant-On Popcorn Button maximizes popping without scorching your favourite snack, and the Child Lock-Out function allows you to lock the control panel completely to prevent the microwave from being accidentally started or used by children. 1.1 cu. ft. SpaceMaker Microwave Oven in Black is rated 4.0 out of 5 by 1161. Rated 3 out of 5 by terriet from Controls except the clock are TOO dim Our model is PEM31DF2BB - not listed on this site. Can barely read the controls. The clock numbers, on the other hand, are so bright, they could probably wake the dead. This appliance might be easier to use as a night light. Rated 1 out of 5 by Duh61 from Things that push my buttons... Our PEM31SM (the previous model Spacemaker microwave) died after 10 years of light household usage. The symptoms suggested a controller board or maybe a power supply. I think it's reasonable to expect white goods to last at least 15 years and be readily handyman serviceable. Part of my negative review is for this previous model. The microwave was mounted under a 24" cabinet with panels on each side. That pretty much restricted us to buying this model. The new one is 7/32" wider than the old one, enough of a difference to make me concerned that it would not fit (although it ultimately did). The bolt pattern changed as well. Why did the marketing product requirements for this model not specify that it be a drop-in replacement for the previous model? The box contained a "Quick Use and Care Guide" and a warranty card, but not a user manual, installation instructions or a template. Worse yet, there are no installation instructions online, and the online template is not full-sized, nor is it scaled to print at full-sized, and therefore useless. I finally ended up making my own template and drilling oversized holes to make it fit. There are no directions for clearance on the back, and I had to assume that the strain relief on the power cable is the minimum depth. It would have helped if the spec sheet and/or installation instructions had described what was needed to replace the earlier model. In short, what should have been a simple swap-out became a Project for no good reason. Fit and finish is fair at best. The inside looks cheap. The ventilation holes in the sides look like they're going to retain food splatter. The access panel for the light bulb is not powder coated like the rest of the inside, and looks like it's there only for shipping. The door has just enough play that it sometimes scrapes the bottom of the cabinet. I do give it credit for being relatively quiet and having a better touch pad than its predecessor. I have only used it once, so defer comment on operation. The oversized GE logo is much too prominent. It would be even if GE were a luxury brand. Our kitchen is not a billboard. We bought this microwave because it was the only one on the market that would fit into our cabinets. Had there been an alternative, we would have probably bought it instead. Rated 4 out of 5 by Powerloan from Handsome appliance Replaced our 13 year old GE spacemaker. (PEM Model #). Love the looks. Inside is smaller though. Smaller plate. Don’t like how the door opens as much. And can’t see as much from the outside looking in. Would be nice if clock brightness was adjustable. It’s a little too bright. Would also be nice if less expensive! Rated 4 out of 5 by GE Byrd from Great fit Replaced the same type/model from a unit that was 15 to 20 years old. Perfect fit and works/looks great - can't believe how quiet it is ! Does this microwave vent through the front, for a built in cabinet application? Good day, This trim kit uses air flow from the top, bottom and sides of the trim frame. Blocking the air flow can cause the microwave to function improperly and may cause damage to the microwave. Allow a 1&rdquo; clearance beyond the edge of the trim frame to provide proper air flow.